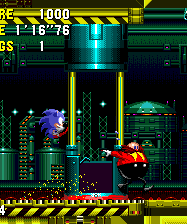 Eggman has set up a mine and conveyor belt system to extract Little Planet's quartz crystals, for whatever reason. 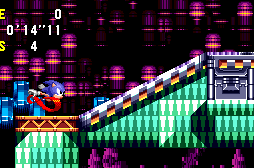 A pleasant little level that combines underground cavern and outdoor forest environments, where paths are often covered in moving conveyor belts, whose direction can be changed by touching nearby switches. 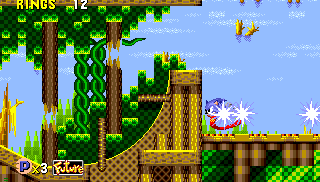 A pretty quick stage with little to worry about, especially compared to either of its level neighbours. 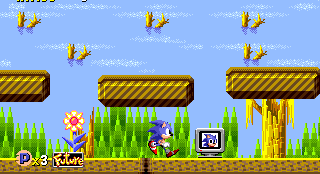 - Quite an industrious and efficient little track for the Japanese version of the Present, yet not forgetting a bit of natural-sounding stuff too, so it's kind of a mix of technology and nature, much like the level in general. The Good Future version is an enhancement of this natural side, and is slower and more peaceful. 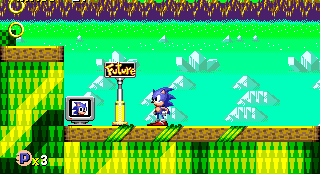 By contrast, the Bad Future features a faster beat and more heavily mechanical style. The Past version of this tune is difficult to describe.. so I won't really bother, but it's pretty much what you might expect. - The Present tune for the US soundtrack is more about guitars and generally being cool. Quite good but not much to do with the level, and also features a word that sounds to me like "saddle". The Good and Bad Future both start off with the exact same intro then both break into different, yet fairly similar tunes that are slower, and not very good in my opinion. 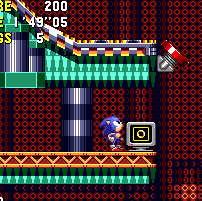 - To stay on the moving platforms with conveyor belts on their surfaces, get a decent footing in the middle or the far side that the belt is moving away from, and don't hold the opposing directional button, but tap it lightly so that you can stay in one place. 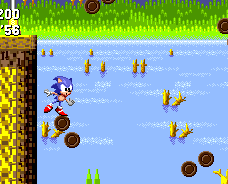 - This is the kind of level you can really rush through in Time Attack and get your record down quite low, if you try and memorise the best routes and where obstacles and enemies pop up that you need to destroy or avoid. The typical length above is only a rough guideline of how long it usually lasts, and you can do better if you spend some time practising the zones. 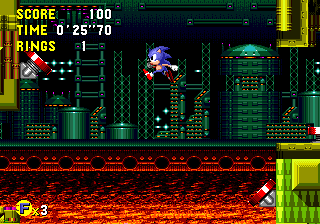 Having hit the first Past sign, proceed to the Red Spring with a Sheild Monitor placed over it that takes you to the upper route. Run to the right along the conveyor and down the downward slope. 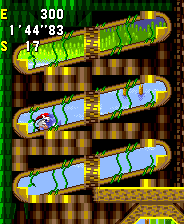 Hit the red spring at the bottom to be taken back up the slope and over the conveyor belt - keep running left and you'lll drop off the edge and run across the tops of the small floating platforms. You will time travel just before hitting the wall on the left. 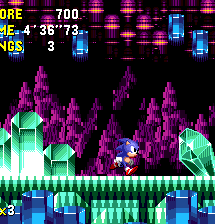 also in the 2011 release, the blue/red glowing crystals appear behind the foreground, unlike the original, and on mobile platforms, they don't glow. 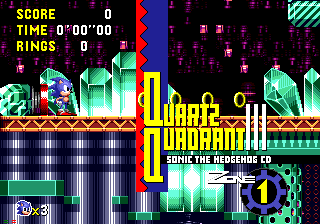 fun fact: quartz is commonly used in clocks and watches, fitting the game's time travelling theme. 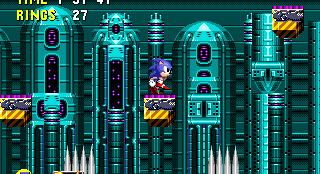 hi it's me again david there's something i found in the past of this level just at the top and end of the level there's a room and imprinted in the background is the letters CX heck if i know what it means though... ps u need debug mode 2 get 2 the room. 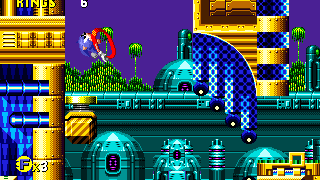 Annoyingly, you can't use vertical conveyors to time travel in the XBLA/PSN port of Sonic CD. 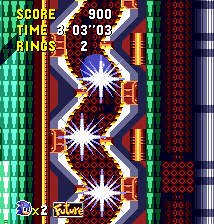 However, you can stand to the right of the first vertical conveyor mentioned and perform a Super Peelout - it's rather risky not guaranteed, but it usually works. 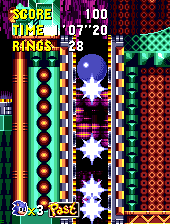 Another easy warp is to go to the top and get the first past sign. 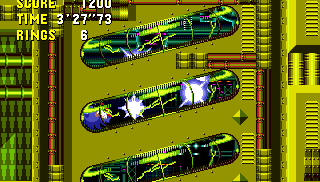 Jump over the pit and super peel out along the top and through the tunnel. You'll spring through the machine and warp. Now, in the past just turn around and there's the machine! I forgot to mention the horizontal ones too. This life is tucked away just at the start of the final stretch towards the end, in the Past. 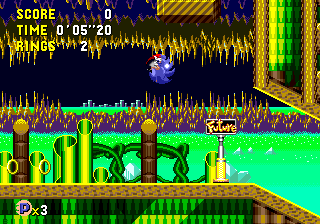 Zone 2 is the only zone in the game to actually feature two of these sign posts that point you towards the goal, as there are two routes leading into it. 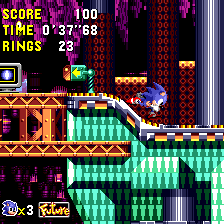 An easy time travel I use is to get the past sign at the beginning of the level and head to the top. 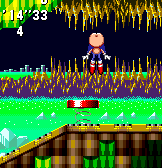 Spin dash down a slope which will throw you into a red spring sending you flying back up. This is enough to make you warp. 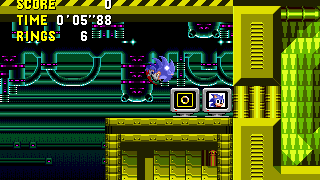 In the US version, you can also restart the level by pausing and then pressing A. 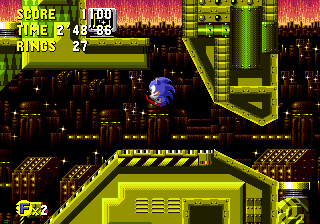 After the second large internal room with the machine, your only route is to head upwards into a final segment that's largely cut off from the rest of the zone, so it's difficult to backtrack out of there in any time zone if you need to, but not impossible. Take my advice though and don't go beyond the second large internal room until you've found everything you wanted to find. 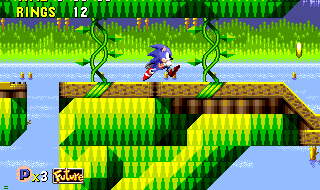 In all cases, the route has a fairly wide gap in it leading to a multi-floor area below with diagonal springs on the corners of the paths, and using these to get back up through the gap can be tricky. 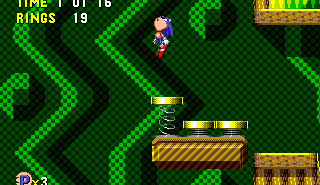 If you managed to leap the gap, you'll find the top route carries on into a curving tunnel at the end. 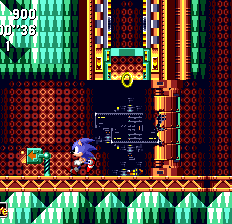 In the Present and Past, if you need to backtrack out of this place, you can head back through this tunnel fairly easily, by making your way along the bumpy conveyor belt path that's just below the top one. 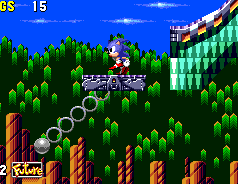 In the Past, there are springs on a platform at the end of this that will allow you to squeeze back into the exit of the tunnel, which is on the left (don't confuse it with another tunnel that leads right further across), but the Present has a slightly more complicated arrangement of platforms and springs for you to use. 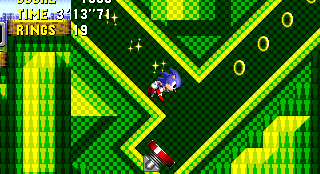 Either way, when you get into the tunnel, you can use a spin dash to go back through it. 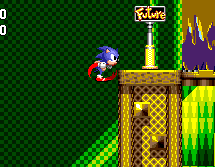 In the Futures, there's no way to get back through that tunnel though, so you'll have to try and use the diagonal springs in the shaft beneath the gap in order to go back up through it. The top red one on the left hand side is the one you want (which can be a bugger to get to anyway), and you have to steer yourself so that you can land on the small moving conveyor belt platform that is now hovering back and forth in the gap, and then leap to one of the sides, or try and make it to the side itself. Difficult to do, and you might be better off giving up one of your lives on a nearby obstacle if you really need to get out. At the start, hit the curve to go straight up or sneak through the opening on the right. 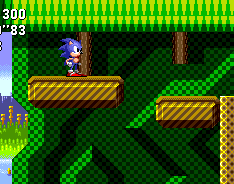 Take the higher route from the start to come across this 1-up on a high ledge to the right. 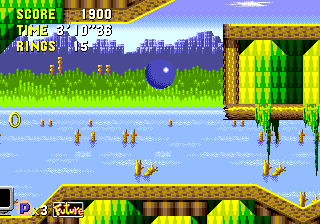 is it worth noticing that if you reach act 3 on good future the background indicates you're outside, but if you reach it in bad future, the background is the one from the internal areas? 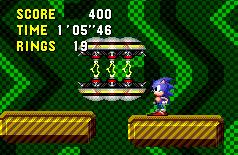 Not too difficult this one, but you do have to figure out a certain pattern of movements and button presses to avoid losing rings. 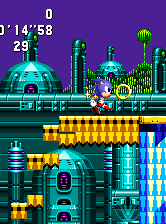 When Zone 3 hits, progress through the short, slightly multi-routed course and perhaps explore it a little and you'll find you won't be short of rings for the battle. 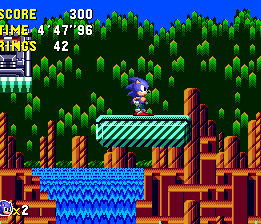 From the start, if you dash up the tall curve to the top of the zone and find the moving block with a spring on it, use this to get to an extra life over on a top right ledge. Continue down the tall slope below it and then get up to the very top route afterwards, and at the far left corner of this path is a shield that might come in handy. 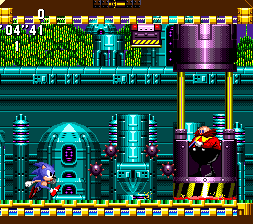 In this boss, you don't even have to hit Eggman; he's protected behind a solid wall that separates you both, and you just have to survive his attacks while his machinery continues to take damage through excessive wear and tear, until it can't stands no more. 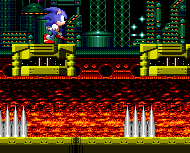 As you walk, or rather run into the arena through a corridor, you may find a horizontal set of spikes following you in from behind, so make sure you enter with haste to avoid it. 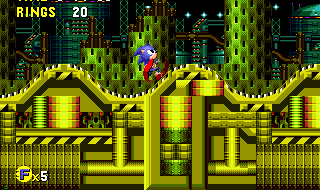 When you get inside, the spikes will remain still, blocking the corridor, and you'll be on a non-moving conveyor belt while Eggman is standing in a booth (ala Sonic 1's Final Zone), suspended above the right hand side. 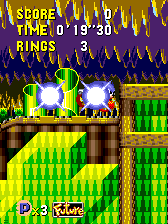 I guess I lied slightly when I said you don't even have to hit Eggman, as you actually do to get the thing started. 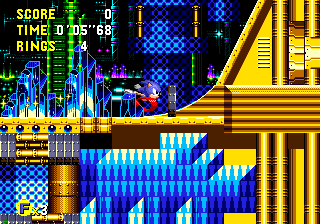 Your leap at him will dislodge the booth and cause it to fall to the conveyor belt which will begin running to the left, inconveniently towards those spikes, so stay on the move! 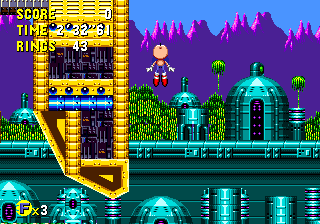 I'd advise that you keep running at top speed and try and remain near Eggman, as far away from the spikes as possible, throughout this boss. 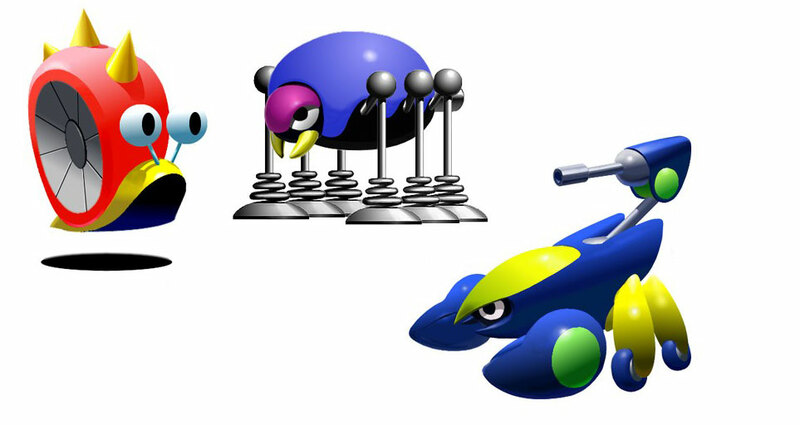 A series of seven spikeballs will then be dropped on you, one by one by an overhead device that follows your horizontal movements until it's ready to release. 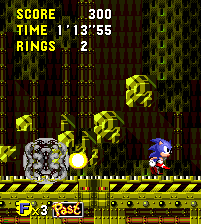 On a conveyor belt this can be very difficult to avoid, and when it hits the ground, it explodes into four smaller spikeballs that fall out of the foreground. 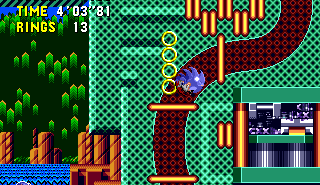 For each, stay running as close to Eggman as possible and allow the overhead device to come out from the right and settle on your location. 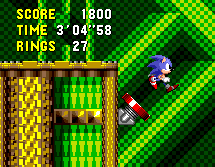 As soon as it stops moving and stays directly above you, release the right button on the D-pad so that you carefully fall back with the motion of the conveyor belt, but not quickly enough that you can't avoid the spikes. Don't press left, as this may ruin it. Hopefully the device will remain where it was and drop the spikeball, which will miss you and release its four smaller spikeballs. As soon as they're gone, quickly jump back to the far right side and slam your digit of choice back onto that right directional button and repeat the process for the next spikeball. 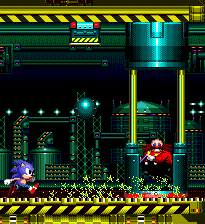 After each one passes, Eggman's booth will cause a little more friction up against the running conveyor belt as it begins to burn up and cause sparks. 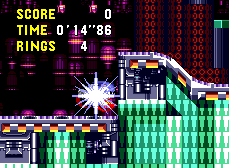 By the end, Eggman is noticeably getting unsettled by this and after seven spikeballs, he calls it a day and runs, leaving the machine to explode and the conveyor belt shuts down. The capsule to complete Quartz Quadrant is located just to the right. You said "seven balls"... Why seven? 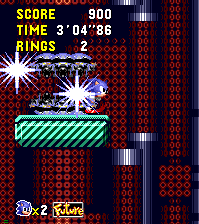 The conveyor belt in this battle has a rather unnatural freature: the faster you run, the slower it moves. Obviously, if the belt goes slower, the friction is minor and it becomes less destructive. So, if you abuse of the peel-out, the battle will take forever to end, and Robotnik will throw some more (or many more) than 7 balls. 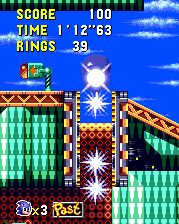 But, if you run all the time at Sonic's normal cap speed, without jumping excessively, only 6 balls will fall. I think six is the minimun. I beg to differ. 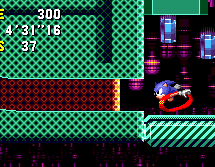 Looking at the conveyor belt, it seems it goes faster the faster you run. 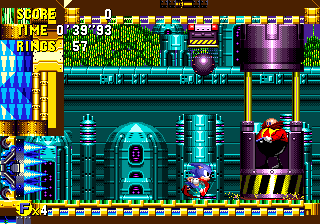 Makes sense, considering when ever you try to run into eggman's machine, you stop, but keep running, which means the belt is moving fast enough to keep you away from eggman. So run fast, and the battle will be shorter! 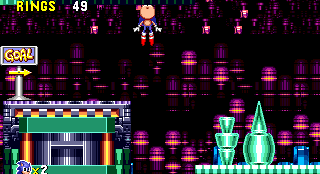 The sad thing is that if you get the Invincibility near the "boss battle" on the upper route, you can literally absorb two hits from his attack, if you are quick enough. Makes a pathetic boss even easier. 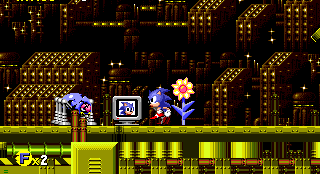 LOL Sonic CD!